Get Cheaper Car Hire in Latvia - Compare, book and save on SUV & Minivan Rental. Cheaper car hire in Latvia can be found here as well as on all sorts of vehicles including estates, station wagon, minivans, SUV and MPV. When booking through us, you will get your vehicle from one of these companies:- Addcar, Auto5, Avis, Budget, Car4Rent, Europcar, National/Alamo or Sixt. You get the usual full insurance with excess, 24/7 breakdown cover, third party, airport fees, taxes and unlimited mileage, all included. Our most requested car rentals are compact cars, like the VW Polo and Kia Picanto automatic. Then comes the all purpose Mazda 6 Estate, and multi purpose vehicles like the Touran seven seater and the Hyundai Sante Fe. These are okay and cars can even be left in another country, but fee applies. Where are the depots? - Get at these airports:- Riga, Liepaja, Ventspils and Jurmala, as well as their city locations and the depot in Daugavpils. Over two million people live here, where the capital is Riga. Spend Euros freely when in town. has a Baltic Sea coastline along with the Gulf of Riga. Need to call someone there, then use +371. 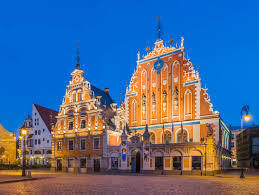 Riga is the capital city of Latvia, although there are other notable places and towns around here that are worth visiting like Daugavpils, Jurmala, Jelgava, and Liepaja. 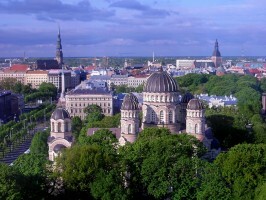 To explore these beautiful cities, fly to Riga Airport and enjoy the trip. Latvia bucks the usual trend for sport(i.e football), by having ice hockey as the most popular sport. 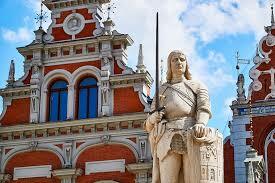 Latvia is a very historic place, that is frequently visited by tourists because of its geographical wonders. Latvia has its share of wonderful beaches as well as an interesting set of flora and fauna. Visitors to this country are both enthralled and enchanted by everything about it, thereby making it a fine choice as a holiday destination of families and groups. With the country's rich physical features, it is safe to say that Latvia is more of a drive and explore type of a country. The coastal part of Latvia is plain and flat while its eastern side is hilly. There are forests and lakes out there too. Getting reduced rates on Latvian motoring made easy. Find cheaper, quality minivans in Latvia here. Discounted rates on range of SUV & CRV in Riga. Latvia is perfect for a spring driving holiday. As you drive over the country's rural roads, you will find many green trees blooming thereabout. During the spring, the climate around here is perfect. Drive to the Baltic Sea or join the Midsummer Night Festival. Then indulge with the best local cuisine. Latvia has a lot to offer its guests, apart fromits cool and calming waters.